You can see the instrument of abdication, signed by Edward and witnessed by his brothers on our Flickr site. At this meeting the Prime Minister began by pointing out the impossibility of the marriage so long as His Majesty remained King. Public opinion, neither in the United Kingdom nor in the Dominions, would stand for such a marriage, if only for the reason that the wife of a King automatically becomes Queen. 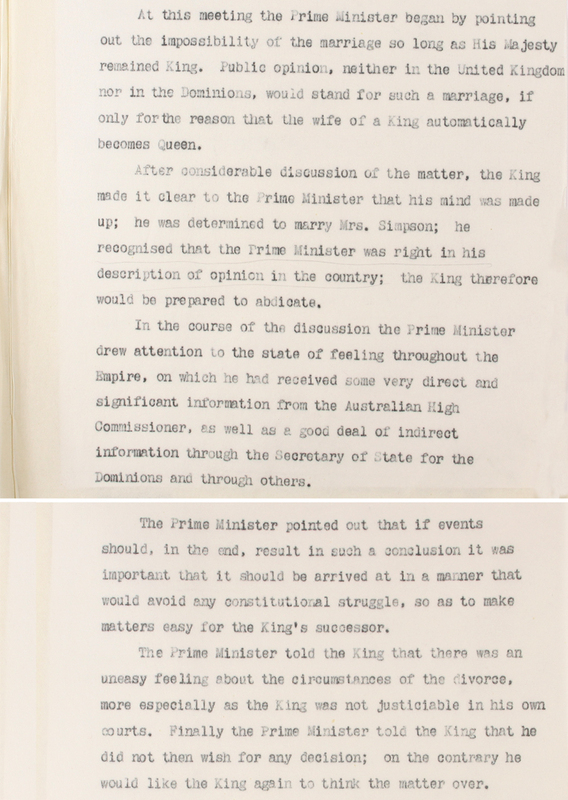 After considerable discussion of the matter, the King made it clear to the Prime Minister that his mind was made up; he was determined to marry Mrs. Simpson; he recognised that the Prime Minister was right in his description of opinion in the country; the King therefore would be prepared to abdicate. In the course of the discussion the Prime Minister drew attention to the state of feeling throughout the Empire, on which he had received some very direct and significant information from the Australian High Commissioner, as well as a good deal of indirect information through the Secretary of State for the Dominions and through others. The Prime Minister pointed out that if events should, in the end, result in such a conclusion it was important that it should be arrived at in a manner that would avoid any constitutional struggle, so as to make matters easy for the King’s successor. The Prime Minister told the King that there was an uneasy feeling about the circumstances of the divorce, more especially as the King was not justiciable in his own courts. Finally the Prime Minister told the King that he did not then wish for any decision; on the contrary he would like the King again to think the matter over.